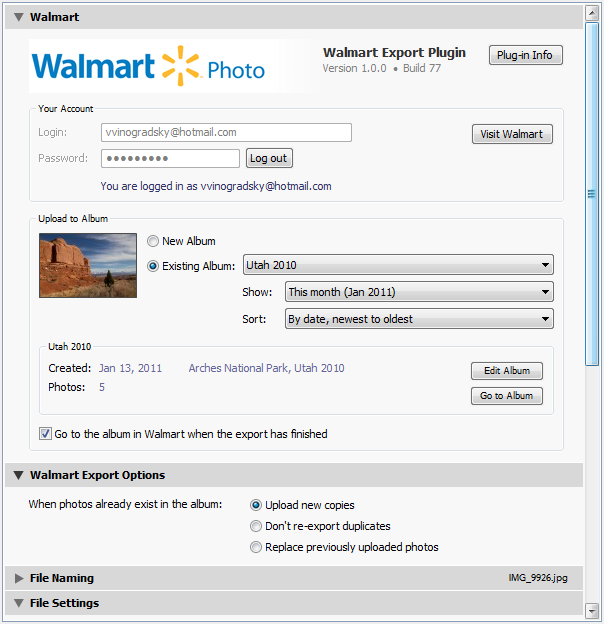 The Export to Walmart plug-in allows you to export and publish photos from Adobe Lightroom directly to the Walmart Digital Photo Service (Walmart US). Walmart have recently migrated their photo service to the new platform, which provides virtually no capability for integration. We'll have to see if the situation changes in a near future. As of right now, the plugin no longer works. And, of course, please register you copy. Your participation is always appreciated! Publish Service: album settings - added "Remove Person Info" option (Lightroom 6). Improved the image size validation mechanism. Now size validation works correctly when rendering uploads from smart previews and doing percentage-based resize (Lightroom 6). Lightroom 6: fixed internal error "attempt to compare nil with number" on export when using "Percentage" as the resize type. Publish Service: fixed the issue with using global watermarks in folder-specific settings. Export Dialog: improved the album caching algorithm. Export Dialog: fixed the issue with creating new albums. Fixed an internal error when the username or password are incorrect. Fixed issues with authenticating after a recent change at Walmart's back-end. Fixed the "? :0: attempt to compare string with number" error when using album-specific resolution settings. Fixed the "bad argument #1 to 'ipairs'" error when installing plugin updates in some situations. Publish Service: New major feature - Reclaim Photos. 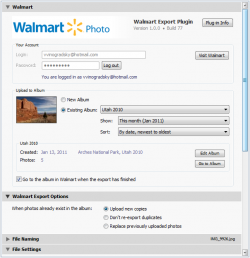 Now you can download your photos from Walmart back to your computer and rebuild your publish service. Available to registered users only. Associate Images: improved performance, particularly on large catalogs. Now you upload photos in the original JPEG format without any additional processing. Fixed the intermittent "Error 500" during consecutive uploads. Fixed the issue with large uploads timing out. Publish Service - Added the ability to customize image size and quality for each album independently. Publish Service - Added the ability to customize watermark and metadata options for each album independently. Publish Service Extras - improved the "Check Photos" functionality. Now "Export with previous" after creating a new album works correctly. Fixed the "Access to an undefined variable: exportSettings" error when clicking Log Out. Improved error handling when attempting to log in with an incorrect username or password. Publish Service: Now you can import existing online albums into Lightroom's publish service. Publish Service: Now you can associate online photos with photos in Lightroom catalog. Publish Service: Now you can customize album covers. Publish Service: Fixed the issue with renaming albums. Improved performance (thanks to the new API implemented by Walmart). Walmart Metadta: Added the "Photo URL" field for the direct link to the online photo. Publish Service: Now publishing the default "Album" album works correctly. The "Upload Failed" dialog now has the option to ignore upload errors for all remaining photos in the export session. Improved the display of photo rendering and uploading phases on Lightroom's progress indicator. Implemented validation of album names. Remove the WalmartExport.lrdevplugin folder, then install the update using the new installation packages. Fixed the "attempt to index local 'albumProperties' (a nil value)" error when publishing into the default album, which Lightroom creates automatically when creating new publish services. Now the plug-in is fully compatible with Lightroom 4. Other minor changes and improvements. Fixed the issue with logging in caused by a recent change on Walmart's back-end. Added the option to turn off the automatic validation of Image Sizing settings. Improved handling of issues related to Internet connectivity. Fixed the issue with logging in. Fixed the "Possible stack overflow" error when typing in by hand. Fixed some backward compatibility issues with Lightroom 2. Checking for updates no longer throws exceptions when my server is offline. Photos that failed to upload are now displayed in a list box with the ability to save the list to a text file. The plug-in now can automatically update itself. The debug log is now submitted in a compressed form to improve performance. An attempt to navigate to an unpublished collection now displays a meaningful message instead of the default Lightroom error. First public release of the plug-in. I am using LR4 and my monitor is calibrated correctly. When I send files as JPG SRGB the walmart lab makes the prints way off color. Asked them to shut off auto color and it still is bad. Will your app make it a color profile which will coordinate with their machine ? You can certainly use any printer profile – you just need to install it on your system and then add it to the list of options that appear in the Color Space drop-down. To do that, open the drop-down list and click “Other…” then select your profile in the “Choose Profile” dialog. I don't print many photos at Walmart but want to print half a dozen copies of one photo for friends. I have your plugin installed in LR4 but it is asking me to register the plugin and pay $15. I thought the plugin worked for free with less than ten photos. How do I use the free version please? You can ingore the message, which is simply a reminder to register. If you run it unregistered you will be limited to 10 photos at per album.